We explore some aspects of phase transitions in cellular automata. We start recalling the standard formulation of the Monte Carlo approach for a discrete system. 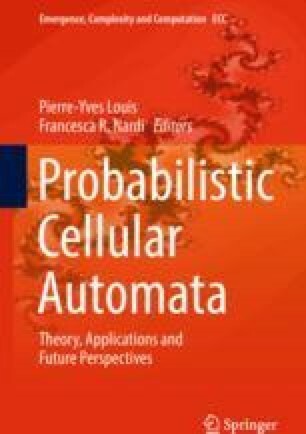 We then formulate the cellular automaton problem using simple models and illustrate different types of possible phase transitions: density phase transitions of first and second order, damage spreading, dilution of deterministic rules, asynchronism-induced transitions, synchronization phenomena, chaotic phase transitions and the influence of the topology. This work was partially supported by EU projects 288021 (EINS – Network of Excellence in Internet Science) and project PAPIIT-DGAPA-UNAM IN109213.